Good music for the harp doesn't exactly grow on trees, and it would be small compliment to say that of all concertos for harp and orchestra, this one is the finest (...). The performance here makes the strongest possible case for this masterpiece, which deserves the widest possible circulation in concert. Ondine's Rautavaara series has revealed to music lovers one marvelous work after another, and with each new release Rautavaara's stature as one of the greatest composers working today only increases. Une découverte majeure ; un grand disque de musique de notre temps. Both Concerto and Symphony are beautifully played by the Helsinki Philharmonic, which is surely one of the finest and most enterprising orchestras around, under Leif Segerstam's dynamic direction. Excellent playing from the Helsinki Philharmonic under Leif Segerstam and state-of-the-art recording. The dark, luminous beauty of this Finnish composer's music has won him a growing audience in the United States. These two recent works show him at his wrenching best. 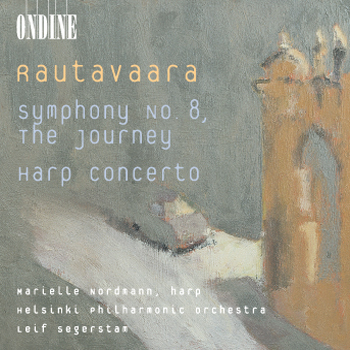 This fifth release in a cycle of Einojuhani Rautavaara's complete symphonies couples the Finnish composer's latest symphonic work, The Journey, with the concerto for harp and orchestra, which features soloist Marielle Nordmann. Leif Segerstam conducts the Helsinki Philharmonic Orchestra. The harp concerto was written for the Minnesota Orchestra in 2000, immediately after the eighth symphony. The Symphony No. 8 was commissioned by Wolfgang Sawallisch and The Philadelphia Orchestra and premiered during the orchestra's centenary celebrations. Its title, The Journey, refers to a borrowed motif in the slow movement, which in an earlier opera is sung to the words: "This journey goes on... whose is it? - Of one who wanders from the end of the journey? ... beyond time?..."